The Orion String Quartet, Ensemble-in-Residence at Mannes School of Music, performs a special all-Schubert concert: the monumental last quartet in G Major and the sublime Cello Quintet with renowned cellist, Peter Wiley. 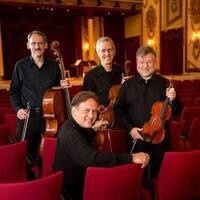 As one of the most sought after quartets in the United States, the Orion String Quartet has been consistently praised for the fresh perspective and individuality it brings to performances, offering diverse programs that juxtapose classic masterpieces with notable works by living composers. With over fifty performances each year, the members of the Orion String Quartet - violinists Daniel Phillips and Todd Phillips (brothers who share the first violin chair equally), violist Steven Tenenbom, and cellist Timothy Eddy – remain on the cutting edge of programming and serve as Artist Members of Chamber Music Society of Lincoln Center. Estimated end time 9:00 PM. Presented by Mannes School of Music.